I have been planning this Grand Canyon vacation for over 2 years for my family and two other families. I have been driving them crazy to do this! They all committed sight unseen. One of my girlfriends asked the Western River agent, "Now what am I paying to sleep on?" ... "A cot," she replied. My girlfriend called me and asked what the heck! I said it would be worth it and it was!! The trip exceeded all our expectations. The Canyon is obviously beautiful beyond compare. 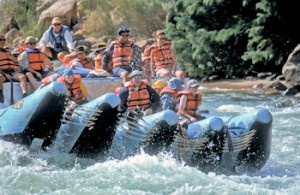 The rafting was a blast and the side trips were fun. Our Western River guides were amazing - hats off to Corey, Stephen, Joe and Shad. They were fun but VERY professional. They MADE the trip!!! Thank you so much Western River Expeditions. That was a trip to remember for a lifetime!